This Sunday’s Blues Session at the Hope Tavern moves west of the traditional origins of Blues Music to the sounds from Louisiana and Texas. Derby based trio Swamptrash will be at the Holton le Moor venue with an evening of Cajun, Celtic and Americana Blues. Think of it as the music you might hear in a Galway bar if The Cajuns were over on tour and an after hour’s session kicked off. The band is fronted by Chris Hall, accordions and vocals, who is known internationally as the founder member and front man of formidable UK bands R.Cajun and the Zydeco Brothers, The Bearcats and The Cajun Roosters. true masters of all things Celtic. 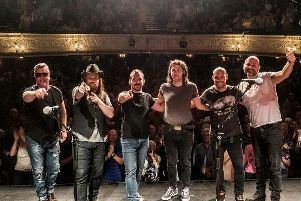 They have worked together and toured Europe for more than 25 years and are best known for their work with Derby Celtic Rock bands Neverland, No Right Turn and The Rattlers. Music starts on March 13 at 4pm and the door charge is £8.